It's hard to believe that Dallas Blogger Brunch has been brunching for one year! Last weekend we celebrated our first anniversary with…brunch, of course! We have eaten at some wonderful restaurants over the last 12 months, but our most recent brunch at Winslow's Cedar Springs is one of my favorites! (I think I say that every month, but it's true!) Winslow's is tucked into a strip of colorful storefronts on Cedar Springs, and though the dining space isn't too large, that adds to the charm of this new addition to Uptown. Winslow's opened in June, which is perhaps why some of you Dallasites aren't familiar with it. When we arrived for brunch, the cozy patio entrance and white interior welcomed us into the restaurant, where we gathered around a table complete with florals by Alicia from Charming Events Company and the cutest place card frames (and party favors!) by Chiara Marie. Bright blooms coupled with the sunny Dallas weather we had over the weekend made it feel like spring time already! I am always blown away by the talented vendors that are showcased at Dallas Blogger Brunch; Alicia and Chiara really made January's brunch a special one. Of course, Winslow's started us off with generous mimosas and coffee along with their Rum + Pecan Caramel Monkey Bread (which was like dessert!). 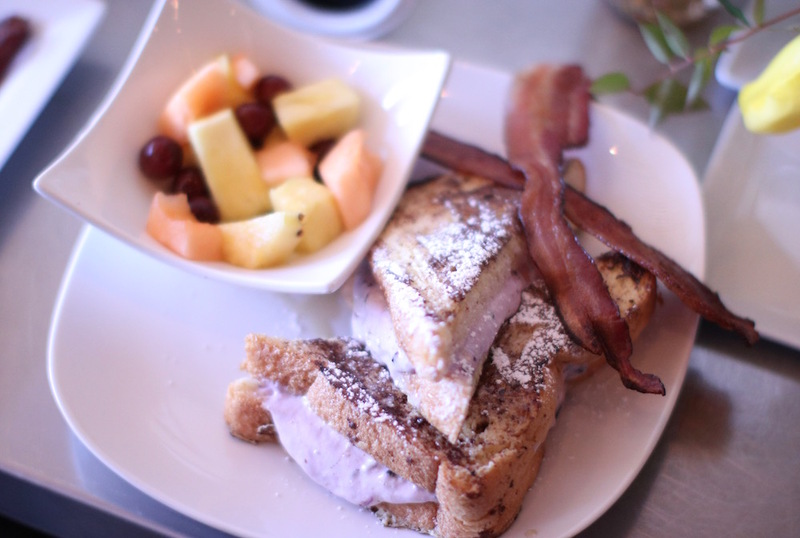 The brunch menu was full of appealing options, but as is my Dallas Blogger Brunch tradition, I settled on the Brioche Stuffed French Toast, and I was not disappointed by the creamy blueberry filling, bacon, and fruit! Other favorites included their Frittata and Breakfast Tacos, all served with fresh fruit or breakfast potatoes. One of my favorite thing about Winlsow's is that most of the other restaurant patrons were regulars and well-known by the staff - something you don't see too often in Dallas. Of course a group of bloggers taking photos of our food causes quite the scene, but I love that the Chef came out to speak to our table and tell us a little bit about the menu; it's no wonder that even in 6 short months, Winlsow's already has a regular clientele and loyal following in their area. I look forward to going back to Winslow's to try their dinner menu…and maybe have another round of Monkey Bread. Do yourself a favor and go to Winslow's for brunch- your stomach will thank you! Thank you to all of the lovely bloggers who attended, and special thanks to our vendors and Winslow's! Photos by An Extraordinary Affaire. Brunch was graciously provided by Winslow's Cedar Springs.